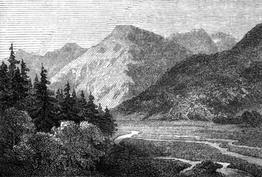 I wish it was larger, but this small mountain landscape is a nice example of the engraving work done in 1857. This German work identified two illustrators but I’m going out on a fairly strong limb and assuming that they have both been gone for more than 70 years – the math is on my side. Tall trees surround a valley created by running water to form a series of peaks. It’s the kind of place that you might want to visit to find some quiet solitude and enjoy the scent of the fresh, mountain air. Hopefully, you’ll find a great new home for this vintage landscape drawing.